According to the recent U.S. Capital Trends Report from Real Capital Analytics, deal volume for the apartment sector rose in August and is on track to hit a record high annual volume of $159.1 billion seen back in 2016. Records are a consistent trend in the booming multifamily industry, especially with fewer single family homes being built per household than any time in U.S. history. In 1993, multifamily accounted for 7 percent of new residential construction spending, but that share has increased by more than 2.5 times, to 18 percent in 2017. This increase is partially attributed to the nation’s growing share of renters. As reported by the U.S. Census Bureau, between 2005 to 2016, 91 percent of all newly constructed households were renters, and renters currently occupy 87 percent of the units in multifamily properties. In 2017, annual spending on new multifamily construction totaled $62.6 billion; this amount is 3.8 times the amount spent in the past-recession trough of 2010, and it is just 2.6 percent shy of the pre-recession peak of 2006. In contrast, single-family construction has failed to recover to the same extent, with real spending still at less than half its peak level. The construction itself creates jobs, and injects money which can be a boom for the local economy. The addition of new units to the housing supply serves to meet the need for housing, which helps keep rent growth in check. After peaking in 2017, apartment demand was expected to finally slowdown in 2018. However, demand in 2018 grew faster than expected, as developers started to build thousands of new apartments. Once again, apartment rent growth is on the rise, increasing average apartments rents to 2.9 percent, according to RealPage. Rents are growing as developers begin to open new luxury, class A, apartments. An immense amount of supply is still underway, especially in areas where the population and employment is growing. Throughout the nation, markets with high levels of multifamily construction have seen larger population growth, increasing employment, and strong rental rate increases despite the growth in total number of units. Texas, in general, is experiencing both population and employment growth, two fundamentals that go hand-in-hand. A lot of this growth is happening with the “Texas Triangle,” which has shown a great amount of economic growth in the last decade. The Texas Triangle, is defined as the three corners Dallas, Houston, and San Antonio, and the area between. Currently, the triangle is comprised of 17 million people over 58,000 square miles, and by 2025, that number is expected to be over 30 million people. The Dallas-Fort Worth and Austin-Round Rock metro areas are two key examples of the immense growth multifamily starts can bring to an economy. 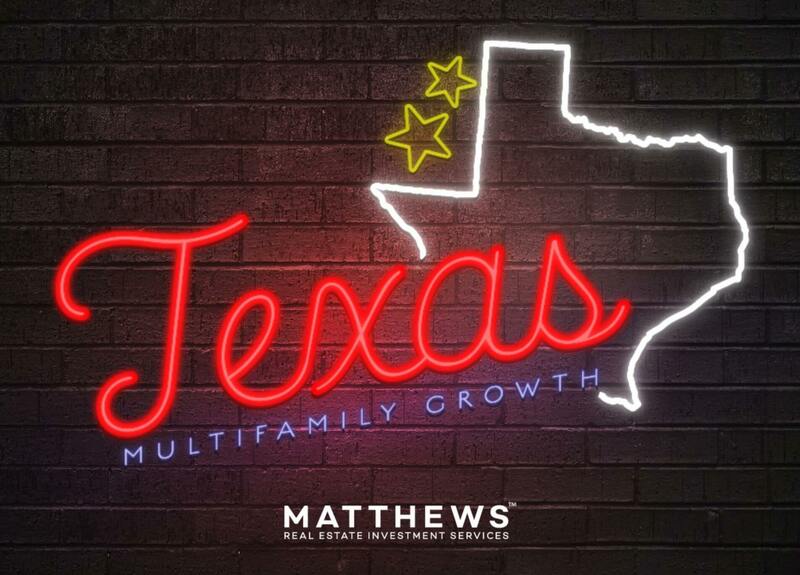 Matthews™ looks at the economic growth these areas have experienced and why multifamily investors should keep their eyes on these booming areas for investment.